Science (non)fiction seeks to employ magic lantern as a mode of experimental educational/factual film. 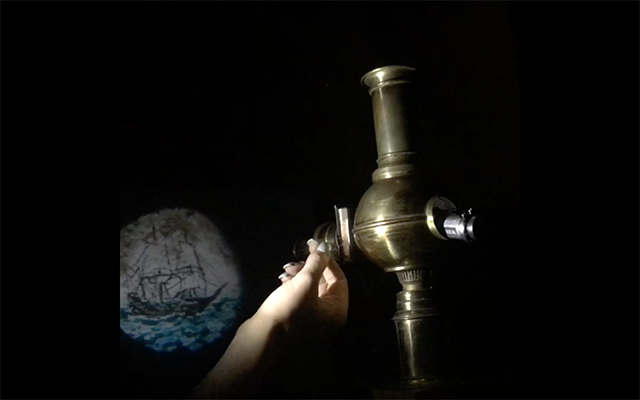 The history of the magic lantern as a pre-cinematic vessel for either fantastic or scientific narrative is extended to address contemporary intersections of folklore, science, and cryptozoology. A curation of handmade illustrated/animated slides and nonfiction text excavates the historiography and potential conflict of fact, fiction and lore in shifting perspectives on science and mythology. The colliding projections of two antique lanterns strive to embrace the emotional resonance of compelling scientific and cryptozoological facts in a way that critically reevaluates perceptions of the past and present while simultaneously kindling the viewer’s sense of wonder and discovery. Melissa Ferrari is an experimental animation artist who acquaints mythologies of the past with contemporary ideas through the lenses of philosophy and natural philosophy. In exposing peripheral histories, she seeks to unveil the mystery and wonder that lies in the shadow of nonfiction, rather than fiction. Originally from Virginia, Melissa is now based in Los Angeles where she is pursuing an Experimental Animation M.F.A. at CalArts. Her films have been shown internationally in venues such as the Ottawa International Animation Festival, Black Maria Film Festival, Slamdance Film Festival, Animasivo, and the San Diego Underground Film Festival. Previously, she worked as an animation artist at Dusty Studio in New York City, where her work was featured in The New York Times Op-Docs, The Museum of Modern Art in New York, Nautilus, TED Talks and PBS.Melissa received a B.A. in Philosophy from Tufts University and a B.F.A. focusing in animation and printmaking from The School of the Museum of Fine Arts, Boston. As a scholar, she critically examines the distinctions between animated nonfiction filmmaking, educational film, and experimental animation documentary. She is currently investigating conventional research methodologies used by independent animation artists in nonfiction filmmaking.